The gopher tortoise is a keystone species of the longleaf forest, known for their deep burrows that provide vital habitat and shelter for not only itself, but many other species. The gopher tortoise is listed as threatened under the Endangered Species Act in the western part of the longleaf range, including parts of Alabama, Mississippi and Louisiana. Working with U.S. 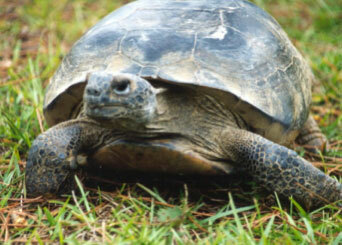 Fish and Wildlife Services, MAWSS provides a refuge for gopher tortoises on 222 acres of land surrounding Big Creek Lake. The conservation bank is dominated by longleaf pine, sandy soil, and native grasses that provide the ideal habitat for the tortoise and related species including dung beetles, the gopher frog and various snakes, including the eastern diamondback rattlesnake. Mobile County property owners who find gopher tortoises on tracts they plan to develop must relocate the tortoises to a mitigation bank. This helps ensure the continued existence of the tortoise population while allowing development to take place. In return for its management of the bank site, MAWSS sells mitigation credits to landowners whose development activities cause the relocations. All relocated tortoises are tested for upper respiratory tract disease and tagged with radio transmitters in order for U.S. Fish and Wildlife Service to monitor their movement.